For one thing (spoiler alert) this is a Romeo and Juliet where almost everyone survives to the final curtain, with a cast of characters pruned down to just Romeo (Flora McIntosh), Giulietta (Alice Privett), Capellio (Andrew Tipple), Tebaldo (Cliff Zammit-Stevens) and Lorenzo (Richard Immerglück), and that begins after the star-crossed lovers have dispensed with balcony-based sweet-talk and progressed into getting the hell out of Verona. It's an opera that Shakespeare purists apparently often turn their nose up at, indignant at the liberties Bellini has taken. Yet I Capuleti E I Montecchi isn't directly related to Shakespeare's play - it's more of a second cousin. Bellini's piece actually takes inspiration from the Renaissance tale that Shakespeare adapted, sharing only a broad structural outline. Watching Romeo and Juliet and not knowing what's going to happen is quite a startling experience. You wait for the familiar old plot beats, but then the opera zigs where you assume it's about to zag, tumbling into unfamiliar territory. Most interesting is the amplification of the hatred between the two warring families. Absent are vaguely noble sentiments of "two households, both alike in dignity" - instead the viciousness, barbarity and gangland elements are cranked right up. It makes for a raw and brutal experience, a love story punctuated by torture and intense misery. Of course, this heightened emotion makes the perfect fodder for a kickass opera. I've seen several PopUp Opera shows over the last couple of years and have been consistently delighted by their light touch and egalitarian approach to an art form that can feel overly rigid. But this is the first time I've seen them do a tragedy and it was fascinating to see their terse style adapting to the tone. The underground caverns of the Vault, here low-lit and stripped back, accentuate the claustrophobia of the piece. Many scenes are set in the cellar of the Capuleti home, making the bric-a-brac feel little like Tony Soprano's basement. The best bits are when the characters light themselves, as when Giulietta cradles a lamp like a baby, strikingly lighting herself from below. This staging is underlined by a bevvy of brilliant performances. I'm no expert so can't really speak for their specific vocal qualities - but their singing communicates such specific emotions that the surtitles are rendered nearly redundant. I specifically loved Flora McIntosh's robust Romeo with a chip on his shoulder. He stalks about the place with barely disguised contempt - his flights of passion and rage recognisably adolescent but less impactful for it. Alice Privett's Giulietta is a fine partner for him - her increasingly panicked performance the product of realising she's only a piece of meat for men to fight over. It's a fine night out and more than lives up to the high standard the company has set for itself. Right now, PopUp Opera feels like the safest of safe bets when planning a night out, marrying technical and performative excellence to intriguingly bold takes on familiar material. You won't see another Romeo and Juliet like this anytime soon. 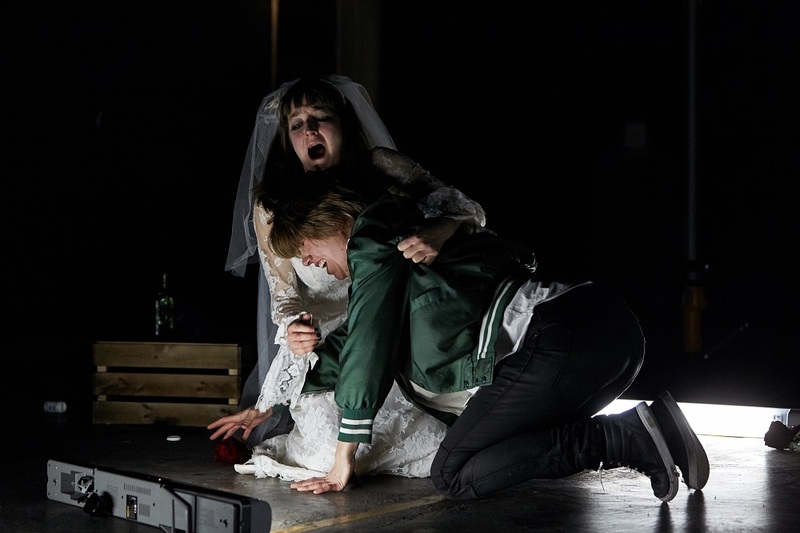 I Capuleti E I Montecchi is at the Vaults until 23 March, then touring. Details and tickets here.